Lori wearing (un)expected, to be published in January. You can find Lori here and here on Ravelry. While I’m influenced by many things -- movies, magazines, nature, dreams -- I’m inspired most often by the yarn itself. Knitting a test swatch can cause me to change my plan entirely, no matter how far I have gone with the original idea. Recently I bought a skein from which to swatch for a new design. I loved the feel of it and how it knit up, so I ordered enough for the sweater in the online store. But when I received the package, I was busy with other projects and put it aside. In the meantime, I had bought a skein to test for another sweater design. As I began to knit the swatch, the pattern for the first sweater began emerging from the needles, and it looked great – fabulous, actually. Of course, I had to go with the new yarn, and the yarn I ordered first is still sitting in my studio. What are your favorite knitting techniques? My favorites change continually. From the beginning I have collected knitting books and patterns and have built a good library. It amazes me how often I still turn to printed books for ideas and inspiration for something as simple as a different cast on or finishing technique, a new way to do a twist stitch, or a new stitch pattern. I confess, though, that I have never steeked. I just can’t imagine cutting into a finished piece! Of all my books, Barbara Walker’s books of pattern stitches are my favorites. There is nothing I love more than pulling one out and spending a whole day, or two, or three knitting a long scarf-like swatch of pattern stitches. I guess that is my favorite knitting technique! I first began writing my patterns to submit them to Knitty. A friend had introduced me to Knitty, and I loved how the magazine and website made great design accessible to everybody. 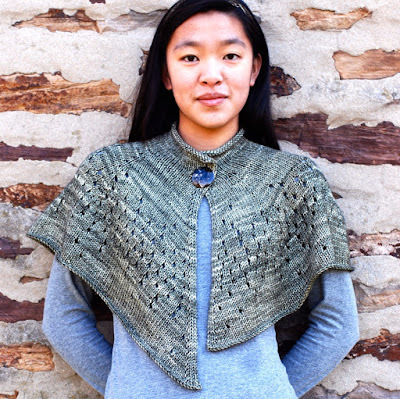 I also loved that Knitty welcomes submissions from nonprofessional as well as professional designers, so when I decided to publish, I thought of Knitty first. I started writing in sizes XS to 5XL because that’s what Knitty requires, and I have continued to do so with each new pattern. I sometimes curse this practice, however, since writing a pattern in nine sizes is extremely tedious! Spoke, published in knitty.com, Winter 2009. Do you look at other designers' work, or are you afraid that you will be influenced by their designs? I am not afraid to be influenced by other designers. We are influenced by each other’s work all the time. It’s part of the creative process. I must admit, though, that there are times when I feel intimidated by other designers’ work and think, “I could never do anything like that! How can I even dare to compete?” Then I remind myself that I am an artist, and I do this work because I have to. Knitwear design is my passion, and I am committed to this journey of evolution and discovery. I don’t know about the controversy. When writing up a pattern, I have one goal: to clearly communicate what I did so that it is understandable and elicits as few questions as possible. I do have a problem, though, with one aspect of the virtual knitting world – that is, the way in which free patterns are used increasingly by merchants to sell yarn, magazines, and ad space. This proliferation of free patterns devalues the work of professional designers. It creates an expectation that yarn costs money but that patterns are free. Although I dream of having a whole gaggle of test knitters, I do it all myself. I am still working on one. As a business school grad, I know well the need, but it’s still hard for me to balance the artistic and the business aspects of being a designer. I spent two years doing nothing but knitting, and I loved it. Then I decided to publish my work. All of a sudden there were a million things to think about that had little to do with creative design. I think about where to submit patterns for publication, whether to publish a book, whether to find a publisher or self-publish, in print or electronically or both. Now that I have a blog, Twitter, and stores on Etsy and Ravelry, I think about mailing lists, domain names, user groups, contests, labels, packaging, layout, photoshoots…and of course, a business plan! It’s complex and overwhelming but also invigorating. I have learned more new things in the last two years than in the previous ten! Right now I am setting goals for 2012. I want to publish at least one new pattern each month, submit proposals each cycle to Twist Collective and Knitty, establish a process for managing each design from conception to publication, broaden my pattern distribution beyond Ravelry, and more. Not yet. Amy Singer and her crew at Knitty took me by the hand and helped me get off the ground as a professional designer, even saving a great design that I had butchered with poor yarn selection. Shannon Oakey has also been a fabulous resource and teacher. 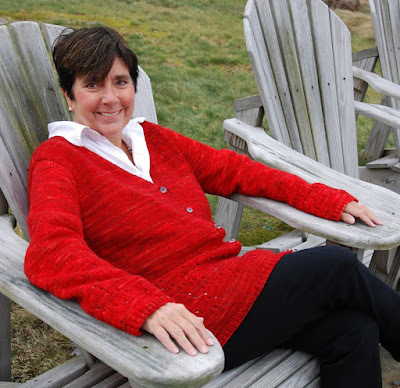 She is author of The Knitgrrl Guide to Professional Knitwear Design and founder of Cooperative Press. But no mentor yet. While I admire some models, I don’t emulate any, since for me this pursuit is personal and privately motivated. I am older and no longer have that raw drive to achieve success with brute force -- been there, done that! I am forging my own course based on my passion for design, with firm parameters for what I am and am not willing to do to be successful. I do feel fortunate to be involved in this pursuit right now, when self-publishing is readily available, and Ravelry and the virtual knitting world are going strong. All of my pattern sales are conducted on the Internet, and I don’t see that changing in the next year or so. But as a knitter, I will always shop at local yarn stores as well as online. It’s important to see, feel, and touch the yarn before buying; photos don’t communicate the qualities of yarn very well. I am fortunate to have the world’s greatest tech editor, although I resisted hiring one at first. 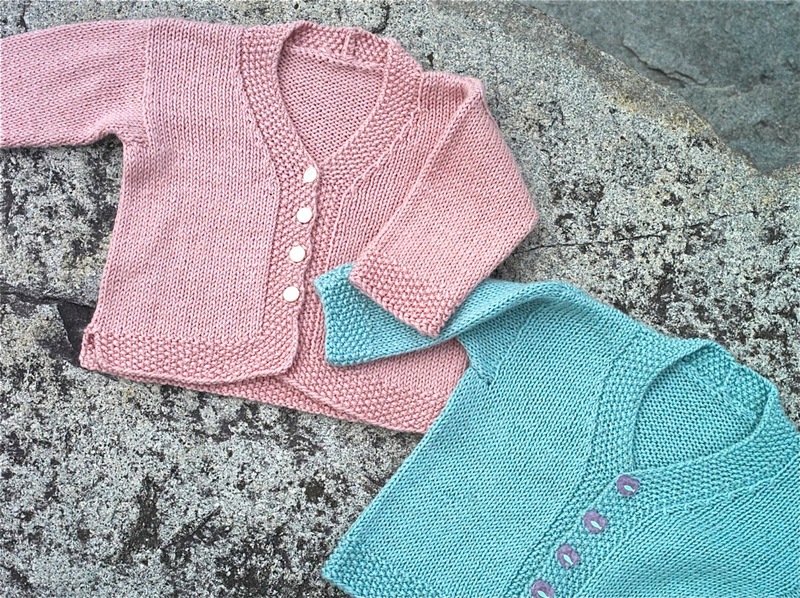 Knitty had handled editing for my first patterns, and I couldn’t imagine paying someone to edit the ones I was self-publishing. How could I ever justify that expense? After a few issues arose, I bit the bullet and did what any self-respecting designer in 2011 does. 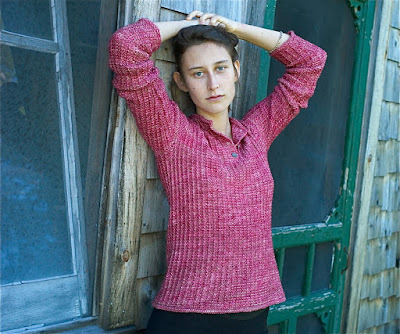 I went to Ravelry’s independent knitting designer group and read all of the entries about tech editors. One really struck a chord -- a seasoned professional tech editor who enjoyed working with new designers to help them find their voice. I sent her a note, and Charlotte Quiggle wrote me back! Working with Charlotte is wonderful, and I am learning an unbelievable amount. I’m glad we are doing this electronically, however, because if Charlotte sent my patterns back marked up with a red pen, I know I would cry each time! In my prior life as a management consultant, I traveled a lot, juggled multiple projects, and handled the staff and daily office operations. I did this all with four children, three dogs, two houses, and a husband. And it was hard! My current work is much easier to control. I get to decide what work to do, what trips I want to make, when and how I am going to work. This is much better for me, even if I do end up knitting through family functions! I don’t think of criticism as a bad thing. Of course, I don’t like getting nasty notes or seeing negative posts about my work. Who would? But generally, I feel that I work too much in isolation, and I value critical input. Well, I could either say that I have been supporting myself since I was in my twenties -- or I could laugh heartily at the idea that my knitting design work could ever generate that much income! My goal is to make VERSACIKNITS income neutral. One of the most disturbing and honest things I learned in Shannon Oakey’s book on Professional Knitwear Design was that only a very few designers earn their living from their work. Most have to add to their income with something related -- teaching classes, for example. To supplement my work, I have a line of handmade cashmere wear that I sell in my Etsy store. So please visit my store and help support an artist! All my siblings are artists. My older brothers are architects, and my sister designed a line of fashion accessories. As the youngest child, I thought I needed to support all of this artistic activity, so I went to business school, finally, I am pursuing my own creative passion. My advice to anyone thinking of a career in knitting is simple. Start figuring out the non-knitting pieces now, because eventually you will be doing them all yourself! Really great interview. I love Lori's designs and it's nice to get to know her a little better. Thanks!